Pi living-water was developed through extensive plant research in Japan in the early 1960s. Bio or living-water, with special life and health giving properties that helped plants thrive well, and beyond normal expectations, was created using a special system. The research by Doctors Yamashita and Makino also found that when trace amounts of ferric/ferrous (iron) salt were energised in the water, the energy of the water increased dramatically. This process, during 30 years of research, created what is now referred to as "Pi Water" or "Living-Water". This Living Water’s life giving energy has been shown to stimulate the self healing properties of the cells of plants and animals alike. It is believed that many diseases are caused by an abnormally acidic/low pH system. In fact, the one thing that almost every named and unnamed disease condition has in common is a higher than normal accumulation of acidic waste in the body. Balanced body chemistry is of utmost importance for the maintenance of health and correction of disease. One of the basic causes of many diseases, especially the arthritic and rheumatic diseases, is Acidosis, or over-acidity in the body tissues. Tap water usually has a pH of around 7.5, or just about neutral. 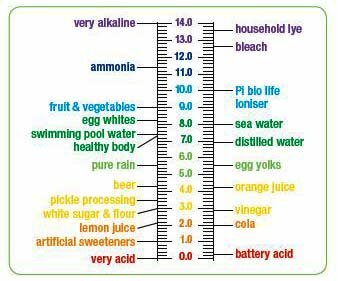 As shown in the following table a very large proportion of what we consume is acidic; the perfect balance is 1 part acidic to 4 parts alkaline. Fitting a Pi Bio Life Alkaliser to your water filtration system means that your body doesn’t have to use all its energy in trying to neutralise its pH. Many people are actually dehydrated and their lack of water is making them sick. It is a matter of survival, not a luxury, to replenish your body's water. The simple step of adding high quality living water back into our diet can help improve our health immeasurably. We all know the benefits of having clean, filtered water. The Pi Bio Life Alkaliser can provide you with the earth’s greatest resource for your personal health and peace of mind. The Pi Bio Alkaliser will provide enhanced living water that is energised and has one of the best absorption rates in the world. People who are looking to reduce acidic toxic waste in the blood, tissues and fluids for the body and who understand the more alkaline state required by most human metabolic processes, will be excited that they can now have energised and filtered living water coming directly from their kitchen tap. ORP - Oxidation Reduction Potential is the ability of water or any other media to oxidise (or more importantly, decrease the oxidation of) another substance or body. Air, with a positive ORP will oxidise metal thus causing corrosion or rust. Any substance that oxidises essentially disintegrates. Water or a media with a negative ORP has the ability to decrease the oxidation, or prolong the life, of another substance or body. The Pi Bio Life Alkaliser, by providing ionised water, significantly increases the negative ORP thus enabling it to decrease the oxidation of other substances - and, in particular, our body, by being a potent anti oxidant. The Pi Bio Life Alkaliser is made of six different layers of rocks and minerals through which the water passes to finally give the living water that is so beneficial to our health.